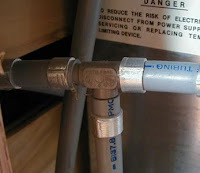 Denney, indeed, the older, gray, polybutylene water tubing is no longer available. The white tubing is called cross-linked polyethylene (PEX) and has a different diameter than the older PB. Thankfully there are “transitional” fittings available that will successfully mate the two types of piping together. One company producing them is called Flair-It. They are available at many online retail outlets, as well as most RV accessory stores.